Dr. Pica earned his Bachelor’s degree in Biology from Millikin University, and then attended the Dr. William Scholl College of Podiatric Medicine at Rosalind Franklin University of Medicine and Science, in Chicago. 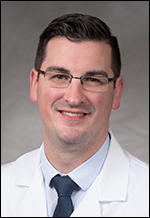 He completed a three-year podiatric surgery residency at The Christ Hospital Health Network in Cincinnati, focusing on comprehensive management of foot and ankle conditions. Dr. Pica has vast surgical experience, including treatment of foot and ankle trauma, arthritis and deformities, as well as diabetic limb salvage. Dr. Pica is Board Certified by both the American Board of Podiatric Medicine and the American Board of Wound Management. He is a Certified Wound Specialist, and has clinical research experience in the management of critical limb ischemia. Dr. Pica is affiliated with CJW Medical Center (Chippenham and Johnston-Willis Hospitals) and St. Francis Medical Center.